Early Earth May Have Been Orbited By Two Moons A smaller companion moon to Earth's moon may have risen and set in the sky for tens of millions of years, a new theory says. The second moon may have later crashed into our moon, leading to the mountains and high terrain on its far side. 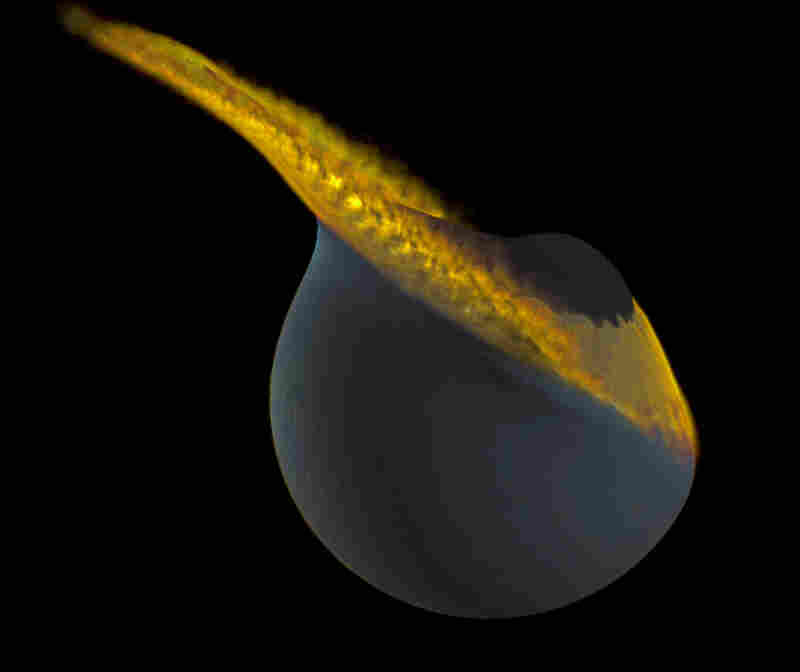 This artist's illustration shows a collision between the moon and a companion moon. Scientists say the collision could be responsible for the moon's asymmetric shape. The early Earth had two moons instead of just one — our familiar moon, as well as a smaller companion moon that also rose and set in the sky for tens of millions of years. That's according to a new theory that says this smaller moon eventually went careening into our moon and is still there, in the form of mountains on its far side. Scientists have long puzzled over those mountains, and the fact that the two sides of our moon are very different. The near side has flat lowlands, while the far side is high and mountainous. Erik Asphaug, professor of Earth and planetary sciences at the University of California, Santa Cruz, says he was at a talk about this asymmetry when he got an idea. "I thought, 'Well, you know, what about just something colliding with the moon, in such a manner that it didn't form a crater, but it just made a big splat?' " he recalls. Researchers believe that our moon was created when a giant object the size of Mars hit the early Earth, sending out a disc of debris orbiting our planet. That debris coalesced to form the moon, says Asphaug, but companion moons could have formed at the same time. He and a colleague, Martin Jutzi, did computer simulations to see what might happen if a small companion moon did a slow-motion collision with our moon. Instead of creating a crater, the collision produced mountainous piles of debris. "And what you're seeing when you look at the lunar far side, if our theory is right, is you're actually seeing the planet that collided with it," says Asphaug. "And so the picture you have just prior to this event is a couple of moons in the sky: our moon, that we know and love, and a sister moon that's no longer there," Asphaug adds. "These would rise and set every day just like our moon does, but you'd have a couple of them." Nothing would have been around to observe these two moons in the sky, however, as all of these events occurred before the dawn of life, when the Earth was still basically molten with just a thin crust beginning to form. The two scientists have published their work in the journal Nature. Maria Zuber, a planetary scientist at the Massachusetts Institute of Technology in Cambridge, says this is a compelling new theory of why the moon can have mountains, even if it doesn't have any volcanoes or colliding continents. The moon is littered with evidence of past collisions, she says, but "all these collisions tend to make holes as opposed to mountains. It took, in the simulations, a fairly specialized set of conditions to make a mountain rather than a crater." "I think this idea is going to get a lot of attention because it's very novel, it's very clever, and people are going to be interested in testing to see whether it's right or wrong," says Zuber. The ideal test would be to go to the far side of the moon and collect a rock sample, but no mission like that is planned, she says. Still, some evidence may come from a mission Zuber is leading that is scheduled to launch next month, called the Gravity Recovery and Interior Laboratory. Twin spacecraft will orbit the moon and map the lunar gravitational field to reveal its internal structure.